It's safe to say that DJ Fresh has had quite a year so far. Whilst working towards his forthcoming album, he released the first single, a collaboration with legendary producer and DJ Diplo, "Earthquake" in the summer to rave reviews across the board. Now, a few months down the line, he is set to unleash his latest single, "Dibby Dibby Sound", which features 19 year old St Louis native Jay Fay, and talented UK emcee/vocalist Ms Dynamite. After the original premiered on Zane Lowe's Radio 1 show back in October as the 'Hottest Record In The World', we've now been treated to the brand new remix from Dutch producer Skitzofrenix. Exclusively premiering on EARMILK today, the remix adds a more prog house vibe to the already carnival party sounds of the original track whilst still maintaining the bass drenched tones. Clangy synths are a heavy feature throughout, with a strong and deep kick keeping the pace of the track bouncing along nicely. Skitzofrenix manages to also keep a slice of the vocal chops in the mix, but focuses more on a synth driven main section, which makes this definitely one for the clubs. 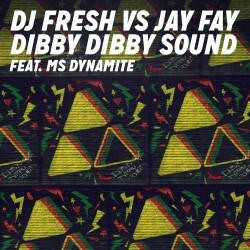 "Dibby Dibby Sound" is the second single from the UK producer's forthcoming album, due in the new year. The single will be released on 2nd February, 2014 via Ministry Of Sound Records. DJ Fresh and Adam F team up on Annie Mac approved "Believer"